This backswimming water-boatman favours fairly barren environments such as concrete sided reservoirs, concrete cattle troughs and stony garden ponds. Eggs are laid between August and mid-October, usually on stones but sometimes on plants, which overwinter and hatch in the following March or April. The nymphs become adult in July and August. There is a secondary life cycle in which adults overwinter and lay eggs in the spring. 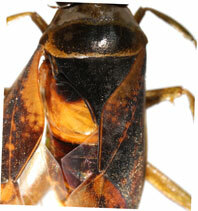 Like all Notonecta species N. maculata is predatory, often taking drowned insects in the barren habitats it occupies. The map is based on records from NBN Gateway, with yellow dots showing pre 1990 records, reds dots 1990 – 2015 records and red on yellow dots overlapping records. 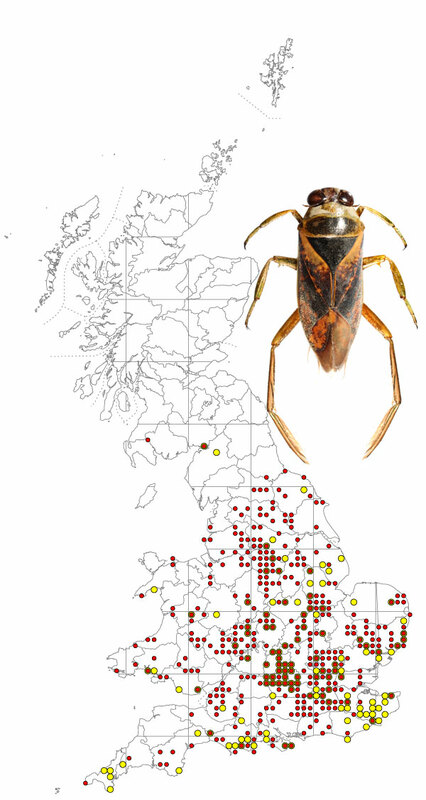 A widespread species in England and Wales but only reaching southern Scotland and absent from Ireland. N. maculata is easily distinguished from other Notonecta spp by the orange/brown colour of the forewings and an orange metanotum (lift wing to see this). Length approximately 15mm.